World Cup Fantasy Football is just around the corner so it is time to start gathering some preliminary thoughts. Here we offer a World Cup fixture difficulty matrix for all 32 nations who are competing at the 2018 World Cup. 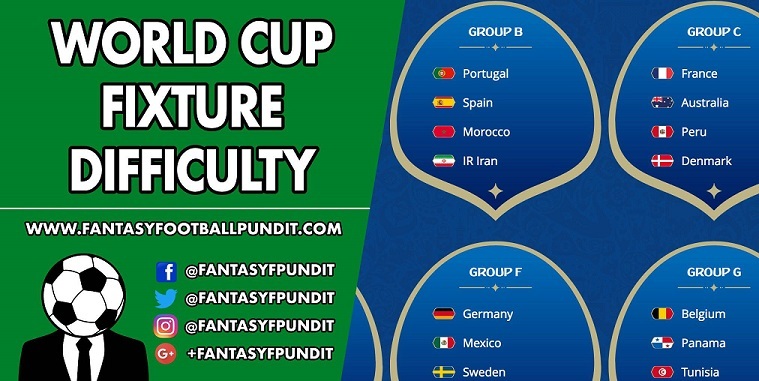 For alternative reading you can also check out our World Cup Fantasy Football Preview article. The numbers reflect the decimal odds of a team winning. For example in Group A, Egypt are 4.6 to beat Russia. Conversely, Russia are 2.05 to beat Egypt which indicates they are the favorites in that game. The lower the odds are the more likely it is that team will win the game. These odds are combined across each row to show each team’s accumulated odds. Panama on the other hand have accumulated odds of 55.56, the highest in the tournament. This shows the overall difficulty of their World Cup 2018 group fixtures. Brazil, for example, have accumulated odds of 4.09 to win their three matches which is the lowest in the tournament. This means that statistically they have the best group fixtures. We will be adding knockout stage fixtures based on their likelihood of occurring soon.